Sparkling Sidecar | What's Cooking at the Genua's? Well it’s my last post of 2010! Hard to believe a new year will begin in a few hours. It’s been quite a year for most of us and we’ve made it. Let’s hope that everyone has a wonderful, safe, healthy and prosperous New Year in 2011! Just be careful tonight if any of you are venturing outside into the ice and snow. Even if you are in warmer climates like I am please be careful and responsible if you go out tonight! I don’t want to lose any readers!! Enjoy and be merry but be safe! So who isn’t going to be drinking champagne tonight? I know I will be sharing a bottle or two with my husband. Probably while in the hot tub! But try something a little different with this recipe. It sounded really cool and it’s got champagne in it! So how bad can it be! As someone once told us, don’t just have Champagne for the special occasions! Champagne is for every day of your life so drink it whenever you want! We do! So now on to the recipe so you can all go get any last-minute items you need and get ready to celebrate! I will be back next year! (Ha! corny I know!) And if cognac is not your thing try adding a little Chambord to your glass instead! Very tasty and festive! 8 ounces chilled Cava (Spanish Sparkling Wine) If you can’t find Cava use any champagne or sparkling wine. 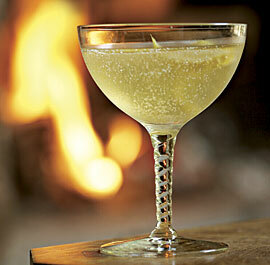 Pour the orange liqueur and Cognac into 2 champagne glasses or flutes equally. Top with the Cava and squeeze the lemon twist over the glass and drop it in. Makes 2 drinks. Adjust as needed!